Emergency treatment and first aid for pets should never be used as a substitute for veterinary care. But it may save your pet’s life before you can get your pet to a veterinarian. If your pet’s skin or eyes are exposed to a toxic product (such as many cleaning products), check the product label for the instructions for people exposed to the product; if the label instructs you to wash your hands with soap and water if you’re exposed, then wash your pet’s skin with soap and water (don’t get any into its eyes, mouth or nose). If the label tells you to flush the skin or eyes with water, do this for your pet as soon as possible (if you can do it safely), and call a veterinarian immediately. Name/description of the substance that is in question; the amount the animal was exposed to; and the length of time of the exposure (how long it’s been since your pet ate it or was exposed to it). While transporting your injured pet to a veterinarian, use a stretcher (you can use a board or other firm surface as a stretcher, or use a throw rug or blanket as a sling). If possible, secure the pet to the stretcher (make sure you don’t put pressure on the injured area or the animal’s chest) for transport—this may be as simple as wrapping a blanket around them. Flush burn immediately with large quantities of water. Quickly apply ice water compress to burned area. Look into the pet’s mouth to see if a foreign object is visible. If you see an object, gently try to remove it with pliers or tweezers, but be careful not to push the object further down the throat. Don’t spend a lot of time trying to remove it if it’s not easy to reach—don’t delay, and get your pet to a veterinarian immediately. If you can’t remove the object or your pet collapses, place both hands on the side of your pet’s rib cage and apply firm quick pressure, or lay your pet on its side and strike the rib cage firmly with the palm of your hand 3-4 times. The idea behind this is to sharply push air out of their lungs and push the object out from behind. Keep repeating this until the object is dislodged or until you arrive at the veterinarian’s office. Never leave your pet in the car on warm days. The temperature inside a car can rise very quickly to dangerous levels, even on milder days. Pets can succumb to heatstroke very easily and must be treated very quickly to give them the best chance of survival. Place a cool or cold, wet towel around its neck and head (do not cover your pet’s eyes, nose or mouth). Pour or use a hose to keep water running over the animal’s body (especially the abdomen and between the hind legs), and use your hands to massage its legs and sweep the water away as it absorbs the body heat. Perform rescue breathing by closing your pet’s mouth (hold it closed with your hand) and breathing with your mouth directly into its nose until you see the animal’s chest expand. Once the chest expands, continue the rescue breathing once every 4 or 5 seconds. Do not begin chest compressions until you’ve secured an airway and started rescue breathing (see the section above, What to do if your pet is not breathing). Gently lay your pet on its right side on a firm surface. The heart is located in the lower half of the chest on the left side, just behind the elbow of the front left leg. Place one hand underneath the pet’s chest for support and place the other hand over the heart. For dogs, press down gently on your pet’s heart about one inch for medium-sized dogs; press harder for larger animals and with less force for smaller animals. To massage the hearts of cats and other tiny pets, cradle your hand around the animal’s chest so your thumb is on the left side of the chest and your fingers are on the right side of the chest, and compress the chest by squeezing it between your thumb and fingers. Don’t perform rescue breathing and chest compressions at the same exact time; alternate the chest compressions with the rescue breaths, or work as a team with another person so one person performs chest compressions for 4-5 seconds and stops long enough to allow the other person to give one rescue breath. Please remember that your pet’s likelihood of surviving with resuscitation is very low. However, in an emergency it may give your pet its only chance. The table below lists some of the differences between reputable, ethical breeders and disreputable, questionable breeders as well as tips to help you tell the difference. We hope this is of some use to you in choosing a breeder you can trust. Also check out List of Questions to Ask a Breeder and About Pet Store Puppies….What is so wrong with buying a puppy at a pet store. 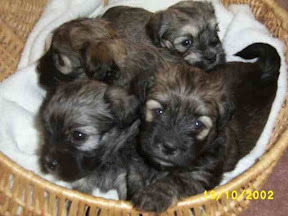 breed to preserve the Havanese breed for the future. if a member, it is in name only and rarely participate in club activities. some large reputable breeders do have a kennel building which houses their dogs. They usually spend many hours each day in the kennel with the dogs. the term “Home raised puppies” is used in advertising as it sounds more respectable. In many instances it may simply mean born and raised somewhere on their properly, does not necessarily mean personally attended to in the house that the term “Home Raised” insinuates. Note: in reality, the costs of registration processes and “papers” are minimal, though less reputable breeders often indicate high costs as their reason for not providing papers. It is a ploy to sell unregistered dogs or to charge extra. may charge a higher price for “with papers” indicating a high cost for registration. Note: In actual fact many health tests are quite inexpensive. A patella check can be done as part of a routine veterinary examination. A CERF eye exam costs in the range of $30 to $50. or they specifically breed “pets” only Caution – If a breeder does not show or exhibit their dogs but offer show puppies , what assurances can they give you that the puppy actually is “Show” potential. Can they discuss the merits and faults of all the puppies to be able to tell you why one puppy is show potential while another is pet. Red Flag – Commercial breeders may offer you the same puppy for sale as either a pet or show or breeding dog, depending what you want, but will charge a higher price for the same puppy if you want it for show or breeding. may deliberately breed outside the standard and may charge more for these by suggesting they are rare. Ie.Mini or pocket size. be wary of contracts that specify that you owe puppies or entire litters back when your dog is bred. One puppy back may be legitimate, but numerous puppies back should be examined very carefully. This pyramid is a way that commercial breeders advance their gains by using trusting unsuspecting owners. Such diversification helps to shield their shady operations. All too often a deemed “show or breeding quality” puppy may not even be a good example of the breed and should not be bred. One item is not enough, you must look at everything as a whole. One or two items on the “questionnable” side may simply mean you need to ask a few more questions but many red flags should be a warning to investigate thoroughly and perhaps look elsewhere to find the breeder that is right for you. We hope this is of some use to you in choosing a breeder you can trust. The Havanese are uniquely different from other breeds in so many ways. One of the most interesting of these, is coat colour. Few other breeds carry such a wide range of colours, markings, and patterns in their coats as the Havanese . The Havanese breed comes in an amazing array of shades; from white, cream, champagne, gold, and red, to sable, brindle, chocolate, silver, and black, displayed as single solid colours or in a myriad of two and three colour combinations. This site Rainbow is the ultimate destination to explore the fascinating world of colours in the Havanese. I go to it often. An excellant article when you are thinking of buying not one but two at the same time! Do not listen to any breeder who says, yes it is not a problem. John Mairs who owns Tamsu (one of the finest trainers in Canada) and has not only taught many dogs but is one of the Go to Guys when hollywood north is in town says absoloutely not . This article is a good read and concurs. Littermate syndrome is a condition in which hyper-bonded sibling dogs have difficulty relating to humans and other dogs. In my most recent case, an owner’s email could serve as a go-to primer for this syndrome: At 12 weeks old, the two puppies were terrified of people and other dogs and frightened of everything outside of their home: Airplanes flying overhead, leaves blowing in the wind, passing cars, and all novel stimuli. It was almost impossible to get the attention of the two puppies even for an instant as they were so focused on each other. They then began fighting frequently. The puppies come to rely on each other, which can weaken the confidence of both of them—often to the extent that they become withdrawn from everything other than themselves. One of the dogs may appear bold and the other timid but in reality the bold one is also withdrawn and timid when his littermate is not present to provide support. Unfortunately this is a false boldness as he has been emboldened by the other sibling’s weakness. Siblings living together often bark at other dogs and may attack to chase other dogs away. This is fear-based; they become so engrossed with each other that other dogs are seen as a threat to their mutual alliance. The siblings become super attuned to anything that may be invading their territory. This unfortunate pair may come to fear all other dogs and unknown people, plus any situation where they are separated from each other. Seven to eight week-old puppies are ready to leave their mother and littermates to develop normally as individuals. I work with my clients to implement an intensive socialization program to expose puppies to a large variety of people (gold standard: 100 people before 12 weeks of age), children, places, animals, noises, bicycles, cars and so forth. Weeks 8 through 14 are the most crucial, and during this period I encourage my clients to take their puppies to as many puppy socials as feasible. Learning that there are other dogs in the world is an important part of normal social development, and play between puppies is how they learn and practice many adult behaviors and communication skills, including the “calming signals” that dogs use to diffuse otherwise fraught situations. In some cases, when siblings are homed together this socialization process is stopped in its tracks. The puppies are unable to develop the confidence that comes with slowly learning about our manmade world. Their intense bond with each other precludes bonding with humans and muddles their learning how the world works. This causes fearful responses to even mundane experiences, including meeting new people or seeing other dogs on the street, or even watching a paper bag blow in the wind. Sure, we’ve all laughed at a puppy who gets startled by the blowing leaf, but he will quickly learn that blowing leaves are normal and in fact fun to chase. Littermate syndrome puppies are unable to process such occurrences to file them under “normal and fun”, and will instead grow suspect of anything or anyone new. Thankfully my more recent case has ended better. During our first appointment, I took each of the two females puppies out individually and spent time working on treat/retreat to gain trust. Both puppies were initially terrified of everything we encountered on a short walk, but within 30 minutes the puppy would take treats from my hand and respond to cues to sit. With the first puppy, I was able to then enter the home and continue treat/retreat; this is the puppy they ended up keeping—she is now thriving. The other puppy had developed a deeper, unhealthy bond to the first and is having a more difficult time in her new home. You can see that this would be a nearly impossible task. So take your time picking out the puppy that suits your home and your life, spend the next year showing him or her the world, keeping in mind that all your hard work will pay off with many years of peaceful coexistence. And once your puppy is a dog, by all means, get a second or third since the animals will be at completely different stages of life. At this point, the older one very well may become a great teacher of love and life to the little one. Is there anything more exciting than new life? It has been a very busy weekend here at Hearts Delite. On Saturday I took hearts Delite Coco Monet to the Wildwood show just to start acclimatizing her to the show environment, the rings, and the crowds.It was an exciting weekend for my handler Norman Fargo. I am always in awe when I watch him show a dog. His dedication and professionalism is beyond compare. The dog show world can be very harsh but his professionalism always shines through and he has no problem sharing his knowledge with other handlers and teaching the tricks of the trade. It is an honour to have him show my dogs and he handles some of the best dogs in North America. Coco had an opportunity to go into the sweeps and walked with Norm in the ring, (well), some times galloped! Came home to the rest of my babies and they are always a happy loving crowd. Never matters what I wear, how I feel, they are just the best company and delight in being with you. I went Sunday afternoon to tape my radio show A View From A Broad on Musiclynk radio and got to meet two extrordinary performers who with a large cast and crew will be performing The Power Of Love, A Tribute To Luther Vandross on Feb 13, 2014. That will be an amazing Valentines present for anyone. I heard the preview and the voices are like butter and I got goosebumps when I heard them sing. I came home to Peter in the whelping pen with Nellie who is as cool as a cucumber and had just delivered four puppies. She waited another few hours and had her fifth and now they are all snuggled in feeding. She really is an exceptional loving girl, and now I will not have one of my bed companions with me for the next couple of months. Still crazy snow out here but today beautifully sunny and so Inka, Howard, Coco, Hannah and I ventured out for a little play and everyone cavorted and frolicked in the snow…. I came back inside with red cheeks, and my entourage came back with snow balls attached to tummies! come back covered in snow balls.